You often hear poker players complain about being card dead. This essentially means that they aren't getting dealt anything very good or "playable." It's not a lot of fun because when you sit down to play poker you want to make something happen. But when you are getting dealt trash again and again it is like your hands are tied behind your back. And this is even moreso the case in a tournament structure because you are getting blinded down and you can't just reload like in a cash game. However, you also know that playing bad hands is a recipe for disaster at the poker tables. So in this article I am going to discuss some strategies for dealing with being card dead in cash games and tournaments, both live and online. The first thing that you need to remember about getting dealt a bunch of bad hands is that this is a natural part of the game and everybody goes through it. Sometimes you are going to get dealt great hands non-stop so this has to be counter-balanced with the bad side too. So there is no real need to get frustrated by it and try to force something to happen. Because you simply can't force your way out of it. One of the biggest keys to being successful in poker is knowing when to be disciplined. You already know that bad cards like 9♣6♦, 7♥4♠ or T♠3♣ (and even when suited) are referred to as "junk" for a reason. This is because they tend to produce really bad results when you play them! Yes, on rare occasions you will get lucky and flop a straight or three 6's with the good old 9♣6♦. But you know full well what happens most of the time when you play a hand like this. And so on. You get the idea. This is why it is a bad idea to play cards like this. So this really becomes a discipline thing at the end of the day. Just because you are card dead (again, a natural part of the game), does not mean that a hand like 9♣6♦ suddenly becomes playable. It is a fold under any circumstance. The great thing about cash games (which is primarily what I talk about on this blog) is that there really is no need to ever try and force anything to happen. The blinds do not increase and you can reload at any point. Also, with the speed of online poker and the ability to multi-table you don't really even have to wait very long to get dealt a good hand. Furthermore with the addition of Zoom poker in recent years you can now just literally "fast fold" your way to the nuts and eliminate being card dead forever. However, getting dealt bad cards for a lengthy amount of time can still be an issue in slower formats like live poker or if you only play one or two regular tables online. Once again this just has to come down to a discipline thing in the end. You know that you can't break the fundamental rule that bad cards produce bad results. So you need to prevent yourself from trying to force something to happen even if it seems like you have been folding preflop forever. Honestly, for me, this is one of the reasons that I rarely play live poker. Despite the fact that there are usually a lot more fish, the pace of the action can be really slow at times. With online poker though, if you are sick of folding a lot of bad hands, I would suggest just adding more tables. Many people say that they cannot concentrate on more than one or two tables at a time online but if you find yourself sitting around waiting a lot and feeling card dead, then you could probably add another table and still remain focused. Tournament poker of course is a different beast altogether because you are dealing with the ever increasing blinds and you are only going to survive if you make something happen. But it is still the case (especially in the early stages of a tournament or a sit and go) that being patient and waiting for the right opportunity is the best course of action. This is especially the case at the lower stakes. Much like in low stakes cash games, there are so many bad players in small buyin tournaments that trying to force something to happen will often only end in failure. They are just going to call your bluff down with their bottom pair and you will be even more frustrated. Most big multi-table tournaments online give you about 75 big blinds to start and there are also deep stack events that you can play in as well. Therefore, there really is no need to worry about anything during at least the first hour in most tournaments and this is especially true in deep stack events. During the middle stages of the tournament you need to start pushing the chips around a little bit more but there is still plenty of room to maneuver. It is only once you get down to about 10 big blinds that you need to start making something happen. But even then, most of your "plays" should be well calculated late position shoves intended to steal the blinds and have some reasonable equity even if called. The bottom line even in tournaments is to relax if you are card dead. Forcing something to happen with a bad hand is a sure way to get yourself quickly eliminated. There is no need to worry even with a short stack. It only takes one or two double ups and you are all of the sudden among the chip-leaders again. Be patient and get the money in good. 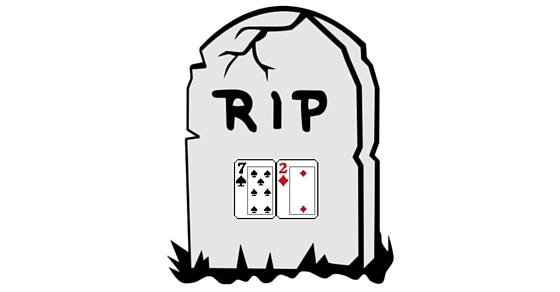 Being card dead in poker is a natural thing that we all go through from time to time. However, the best players know to still remain disciplined during these times. A bad hand is still a bad hand no matter what has happened in your recent playing history. Remember to view each poker hand as an independent event. Trashy hands like 9♣6♦ are a fold under any circumstance. With cash games, it is much easier to handle getting dealt a lot of poor hands. The blinds are static and you can always reload. Just stay disciplined and wait for the right spots. If you still find yourself getting antsy, then try adding an additional table. Or play Zoom poker and never be card dead again! With tournaments, once again the whole card dead thing is mostly in your head. You don't really need to force anything to happen until you are seriously short stacked (e.g. 10bb or less). And even then, you should still only be shoving semi-decent hands in late position steal situations. Bad cards are bad cards no matter the circumstance. One of the biggest keys to success (especially in low limit poker) is learning to be more patient. Don't allow a run of bad cards to get you down. Poker is a long run game and everybody goes through being card dead from time to time. Stay disciplined, stick with the game plan and you will be rewarded in the end. Hey there Nathan great stuff as always. Got to say I'm a little surprise to see so many articles released so fast (not complaining). How are you finding Tiltbook so far? See ya around! Take care! Thanks Jorge! I have decided to pick up the writing volume so there will be plenty more coming. I don't use Tiltbook too much to be honest, just follow a few friends on there. You were mentioned in a software demo for Poker CoPilot I watched last week (streamed from Barcelona) soI went looking and I found your site --- Great Ideas and presented in a very straightforward way....Really. Thanks. Keep up the good work! Wow cool. Glad you like my site! Nice job Ritchie, gl with the move! I'm always torn when playing live & I go card dead. on one hand, I'm fine waiting out the dry spell, but on the other, I am tempted to open raise or 3-bet with garbage, feeling that everyone will fold because I haven't played a hand in a few orbits. If I wait until I actually *do* get a decent hand, they will definitely just fold. so why not try to steal something when they want to give me credit? then if my hand quality picks up, they are more likely to look me up since I broke the ice earlier. I am talking more about live games. Even though people have HUDs on-line they are less likely to notice you folding hand after hand for a few orbits if they have long term stats on you & know you're not a nit. I'm not suggesting splashing around a lot, but a well timed open or 3 bet after you have been folding like crazy could work. I'm happy to admit that I do not have a lot of experience live, and certainly less than Nathan on line, lol. Good points ekw and I agree! As always good advice Nathan. Yet, I'll never ever forget a table in Vegas where everybody (every single player) limped. I was on the button with 23off and was going to fold (in spite of the limpers). Then I figured what the heck and limped in w/ the rest. Imagine my delight when two 3's hit the flop and another 2 landed on the turn. I played for value and it was a great night for winnings! Sometimes - you just have to follow the yellow brick road with the fish! Haha, true, sometimes you never know! Also I like the increased amount of posts on FB. Keep it up - its making me want to return to the tables after a gruesome back surgery. Thanks TeeGee and I hope your recovery is coming along well!